Number two, collapsing prices for oil and other commodities have been absolutely brutal for South American economies. They rely very heavily on exporting commodities to the rest of the world, and so at the same time their debt problems are exploding they are getting a lot less money for the oil and industrial commodities that they are trying to sell to North America, Asia and Europe. And of course Brazil is not the only South American economy that is a basket case right now. In fact, things in Venezuela are far worse. In 2015, the Venezuelan economy shrunk by 10 percent, and the official rate of inflation was a staggering 181 percent. Could you imagine living in an economy with a 181 percent inflation rate? Cardboard signs on the door warning of “No bread” have become increasingly common at Venezuelan bakeries. Venezuela gets 96 percent of its foreign currency from oil exports, and as crude prices have plunged, so have the country’s imports — among them wheat. The leftist government of President Nicolas Maduro has tightly controlled access to hard currency, and this has affected imports ranging from medicine to toilet paper. Now it is seriously affecting imports of wheat, which Venezuela does not grow. Add to this the soaring inflation rate — 181 percent in 2015, the world’s highest — and you see why customers are mainly interested in buying basic food items such as bread. Here in the United States, there are still people who doubt that an economic crisis is happening. But in Venezuela and Brazil there is no debate. And of course the evidence of what Mansharamani was talking about is all around us. Just this week we found out that Chinese state industries plan to lay off five to six million workers, U.S. factory orders have now fallen for 15 months in a row, and the corporate default rate in the United States has now risen above where it was at when Lehman Brothers collapsed. There are some people that would like to point to the fact that stocks have bounced back a bit over the past couple of weeks as evidence that the crisis is over. If they want to believe that, they should go ahead and believe that. 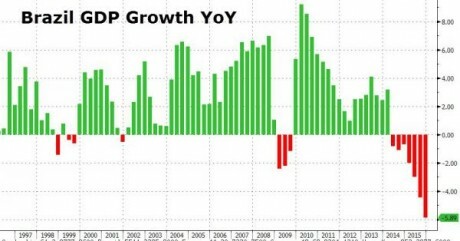 Unfortunately, the truth is that the hard economic numbers that are coming in from all over the world tell us very clearly that global economic activity is slowing down significantly. A new global recession has already begun, and the pain that is already being felt all over the planet is just the beginning of what is coming.